Character Dance is a specific subdivision of classical dance based on national and folkloric traditions that have been stylized and included in classical ballet. 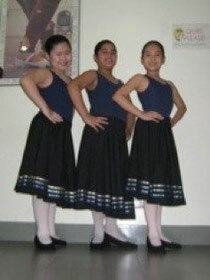 Our program is accredited to enter students in the international character dance examinations starting at age 7 at the Primary Level to Advance 2. The students will be introduced to at least 2 European countries where they will be oriented about their culture, traditions, music, costumes, and their dances. Our school is accredited with the I.S.T.D. National (London).